Author Sarah Crowe moves to a farmhouse, the “old Wight Place” in New England to write her next book in solitude, where she stumbles across an old-fashioned typewriter and an unfinished manuscript both once owned by the late Charles L. Harvey. His story, a personal diary, describes his research of 'the red tree.' The very same tree whose foreboding presence can still be seen from Sarah's kitchen window. And it's giving her nightmares. As Sarah reads Harvey's diary, she starts to write her own and discovers the dead man's unhealthy obsession for the ancient oak is now rapidly growing into her own inescapable living hell. The fine line between reality, her disturbing dark dreams of Amanda, her dead lover, and the strange sirens of doom distort her mind until she can no longer tell reality from her imagination. Will Sarah be able to escape being the tree's next sacrifice or was her fate, like that of her ex- lover Amanda and previous tenant Charles, sealed the moment she walked through the cottage door? Caitlin R. Kiernan is a new-to-me author with an amazing, yet macabre imagination! 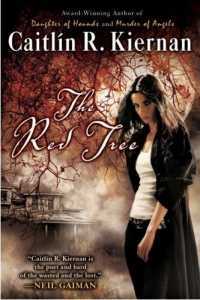 The Red Tree is so believable, tightly written and damned scary, I truly felt like I was reading a dead girl's diary. It amazed me how I could feel the suffocating New England heat one minute and the next I'd be chilled to the bone by the startling, ever-watchful, tree's evil presence, which loomed over this story like a shadowy ghost with a mind of its own. If you like books that spook you then The Red Tree will leave you satisfyingly unsettled making you switch on the lights before entering dark rooms. I'm a fan of Edwardian and Victorian ghost stories in the style of M.R. James, Bierce, Poe, and Lovecraft (these and other like authors are mentioned within), and this has that cold icy touch of ghostly, gothic horror mixed with the appeal of days long past, only written in modern times. Kiernan plays on a deep-rooted fear of powerful superstitions, dark magic, ancient rituals and mythical legends we'd rather not uncover and captures the anguished souls of the dead, unwilling to die. A detailed, intelligent and suspenseful plot that will fill your nights (and days) with an intense, growing uneasiness as you read. This author is definitely at the top of the tree when it comes to dark fantasy. Amy Romine's Giveaway* closes 31st December 2010. Winner announced the following day! *All giveaways are open to all "worldwide" unless otherwise stated. I loved the sound of this, but sadly, it's not available as an ebook. I'll just have to put it on my wishlist and wait for the publisher to get with the programme! LOL Great review... maybe someday I can read it too!